She experienced working in China as an office manager at 28. Became familiar with Chinese culture, got married and had a child there. She now lives in Japan now and is the mother of a 2-year -old son. You were majoring in Chinese language at university. Yes. I received advice from my father, and I thought that Asia, particularly growth in China would be expected in the future. Based on this belief a need for Chinese speakers would be in demand. After graduating from university, you found a job in Japan. Why did you make up your mind to work in the management consulting industry? I desired to pursue and strengthen my expertise of service to raise added value to products. At that time, I hoped to work in the service process improvement for B to C companies and customer service. What made you decide to work abroad? I wanted to work with foreign languages since I was young. During some short-term study in Beijing, I was surprised at the low level of service in China. I realized the importance of distinguishing our company from the competitors through good service. I decided I was willing to work on reforming the business model for service in China. Would you tell us how you came to work in China? How your interests and concerns have changed since working abroad? When I joined a management consulting company that supports management and activation of organization, at the time their only overseas offices were in the U.S. and Korea. For 2 years, I worked as a sales representative in our Saitama branch, and I participated in regular dinner parties with the chairman and executives. During one of these occasions I overheard talk of launching a China office and told them directly, without hesitation, that I wanted to work in China. I had been drinking Japanese sake (alcohol) and was feeling quite comfortable and didn’t think twice about speaking up (laugh). A half-year later, my dream became reality and I went to Shanghai! I was 25, with no fear, only curiosity. That’s all I had. Your story on having the opportunity to work in China gives me a very positive attitude toward work. Were you conscious of advancing yourcareer? Actually, the word “career” didn’t come to mind at all when I was a university student and looking for a job. Would you tell us your challenges, happiness and difficulties working in China and adjusting to the customs and culture? I found my job to be more rewarding in China than it had been when I was in Japan. I was in charge of many companies and there was pressure to achieve results. It was a challenging time but I was up for the challenge and thoroughly enjoyed it. To increase customer acquisition, I visited many clients in Shanghai, Beijing, Dalian and Shinsen. I took business trips two or three times a week, working from my laptop whilst travelling between cities. I needed to set up everything from the scratch, and all my work was directly reflected on the organization. That’s why I worked so hard. I was required to think and create everything – it was hard work but I was happy for the challenge. The toughest thing was communicating with some of the Chinese staff. I found that the Chinese culture and way of thinking, was very different from Japanese. I especially had trouble with the culture of concern for personal honor. I made great effort to convey my thoughts and understand their true inner voice. My Chinese colleges and I overcame conflict and managed to build a good relationship of respect and support for each other. Would you tell us challenges as an office manager and any impression on communication with staff? I had previously made an effort to achieve “my” targeted benefits, but after I became the office manager, those goals became something to be accomplished as a team. The staff was not interested in target sales at first, but over time we could share delight with each other when our clients accepted our proposals, finally bringing a feeling of unity. They improved their ability within a year and came to get more contracts. What differences did you feel working in china, compared to Japan? Initially it was the idea of “carrying out my word”. Chinese people don’t recognize a person’s job title. At first, it is a premise that I can do it before I ask, and it is necessary to explain the reason clearly. The second one is a “give and take” idea. We need to understand and recognize our own strength in each other. Beyond title, without a relationship based on trust, we couldn”t bring about a feeling of unity. Numbers in Chinese, manners and greeting, those are what I learned from them. Would you tell us your feeling about Chinese women’s lifestyle, working, and private life? Women have a lot of opportunities for promotion in China, and many return to work just 6 months after childbirth. They have a favorable working situation because of a custom that grandparents take care of children. Chinese people rarely work overtime and most value spending time with family. They conduct their tasks properly in limited time. That’s the impression I have. In Japan, of course, we value family as they do, but it is difficult to leave at the fixed time and we usually work late. By touching other cultures and people, do you have any big change in your vision and sense of value? I might have lost my shyness. My voice became loud too. What’s a good point that you aimed to achieve in your twenties? In my twenties, I had the physical strength and learned anything new very quickly, and it was good that I had something to devote my effort and various experiences to at that time. After I married and had my son, it was difficult to work under the same conditions as before, but I believe those experiences were useful to make a good relationship with my son. I didn’t feel that I needed courage (laugh). Basically, my life is built by myself, and it depends on my actions. Do you usually make a conscious effort to live your daily life? I imagine what kind of life I want to spend, what kind of person I want to be, and make plans to make the goal realistic. I also pay attention to utilizing time effectively. You have a son now, and do you think your experience of working abroad may influence on your child rearing? Any change in your mind or thoughts? I hope my son can learn and speak English without trouble. In China, children are taught, “Never lose and become No.1” in education. I can’t say unconditionally, but Japanese have a great regard for cooperativeness and their thoughts on education are extremely different compared with those of Chinese. I think both are important and don’t think either are wrong. The most important thing is to have one’s own opinion and tell it simply. Do you have any beliefs in bringing up your child? I would like to teach my son to think and make decisions for himself. You attained goals in your twenties and reached a woman’s turning point, which are marriage and child-birth around your thirties. It is one of the ideal lifestyles in a woman’s life planning. After your son has grown up and you have enough time, you can go ahead towards another step, would you like to work in the same field or challenge a new area? I would like to utilize my career, but actually I’m still thinking now what I should do next. It must first balance my husband’s future job relocations and take care of my son. If you have an opportunity in the future, do you wish to work abroad and with local people again? 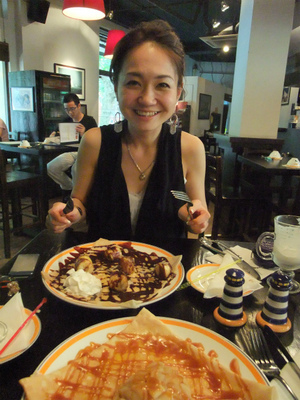 Hiroko-san has a soft personality and is a mother of one child. She is powerful with energy in her heart and is a charming woman. Hiroko-san, thank you for sharing your wonderful story!